Amazon is seeking hundreds of entrepreneurs across the country to launch and operate their own package delivery business. The Delivery Service Partner (DSP) program provides an opportunity for strong leaders who are passionate about developing a hardworking team to start their own business. Joining a robust community of small businesses, you will help deliver thousands of packages to customers every day. Launching a business becomes that much easier with Amazon’s delivery volume and resources behind you. You can leverage a suite of exclusive Amazon-negotiated deals to start your business, and work with our network of top-in-class service providers to keep your operation rolling. You’re a coach. This is your team. Your most important responsibility is recruiting and retaining solid drivers who will enable your ongoing success. Your team of drivers will deliver 20 to 40 routes per day, serving thousands of customers. You lead with a can-do attitude that ensures your business reflects Amazon’s high standards and customer-obsessed culture. Coach, develop, and motivate your team to exceed expectations on every delivery. Deliver a great customer experience and get the opportunity to hire more people, deliver more packages, and grow your business. Exclusive deals on Amazon-branded vans, comprehensive insurance, industrial-grade handheld devices, and other services help you get your delivery business up and running. We provide three weeks of hands-on training to ensure you’re set up for success. 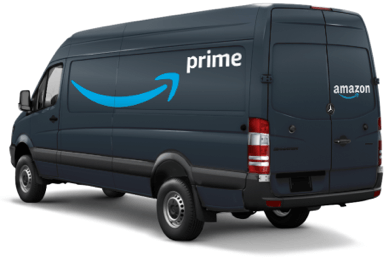 You’ll start with a one-week introduction to Amazon in Seattle, followed by two weeks in the field working alongside existing owners and drivers to learn tips and tricks for operating a successful delivery business from those who know it best. We give you the tools and technology you’ll need to run your business, designed to keep your operation running smoothly. Owners receive ongoing support from Amazon, including a comprehensive operations manual, driver assistance for on-road issues, and a dedicated account manager. Amazon brings more than 20 years of technology and logistics experience to guide you in one of the fastest growing industries in the world. If you’re a customer-obsessed people person and enjoy coaching teams in a high-speed environment, this is the ideal opportunity for you. As an owner, you’ll be fully responsible for hiring and developing a team of high-performing drivers. Access to Amazon’s exclusive discounts on a suite of assets and services keeps owner startup costs as low as $10,000. As part of the DSP community, you’ll operate your own delivery business with 20 to 40 vans and 40 to 100 employees, working alongside other owners in your area. We’ll help you set up and get ready to operate out of a local Amazon delivery station, and you’ll provide consistent coaching and support for your team, ensuring packages are delivered to customers seven days/week, 365 days/year. Amazon is currently accepting inquiries from the following states: Alabama, Alaska, Arizona, Arkansas, California, Colorado, Connecticut, Delaware, Florida, Georgia, Hawaii, Idaho, Illinois, Indiana, Iowa, Kansas, Kentucky, Louisiana, Maine, Maryland, Massachusetts, Michigan, Minnesota, Mississippi, Missouri, Montana, Nebraska, Nevada, New Hampshire, New Jersey, New Mexico, New York, North Carolina, North Dakota, Ohio, Oklahoma, Oregon, Pennsylvania, Rhode Island, South Carolina, South Dakota, Tennessee, Texas, Utah, Vermont, Virginia, Washington, Washington, D.C., West Virginia, Wisconsin, Wyoming. Amazon is also currently accepting inquiries from Canada and outside the U.S., but not from the European Union.